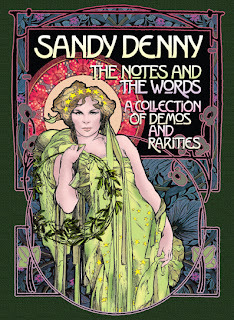 Due to the phenomenal and totally unprecedented demand for Island’s complete Sandy Denny Box Set, released in November 2010, Universal Music is issuing a limited edition 4 CD version. This boxset will be released on the 29th of October, and is available for pre-order now on Amazon UK. The original box set has become one of the most collectible box sets of all time. Now, for fans that missed out, this new four disc set boasts 75 songs that represent the cream of the rarities, demos and outtakes from the box set, including 17 demos taken from the master tapes of Sandy’s early home recordings. Among these is the first known recording of 'Who Knows Where The Time Goes', recorded in 1967. The set also features demos, outtakes and alternate versions of Fairport and Fotheringay classics as well as many tracks from her solo career. There’s nothing on here that wasn’t on the big box. The majority of tracks appeared for the first time on the big box. A handful of tracks on here appeared first on the big box, then again as bonus tracks on the “deluxe” reissues of the solo albums. There’s a small overlap with Boxful Of Treasures and the Who Knows Where The Time Goes boxset. There are a (very) few tracks that have appeared before on single albums (e.g. Fotheringay 2, Alex Campbell & His Friends). The packaging is more sensible this time – you don’t need to build an extension to your house to accommodate this one. Overall, I’d say if you’re a Sandy completist and you missed out on the big box (or couldn’t afford it), then this is definitely worth having. The latest issue of Clifton Life (pp56-9) has an affectionate piece by Ian A Anderson looking back to the heyday of the Bristol Troubadour club in the 1960s. He recalls the famous names who graced its tiny stage, Sandy among them. It also includes a photo of the reclusive Shelagh McDonald, taken on her visit to Bristol earlier this year. Currently on eBay is a rare chance to acquire a Sandy autograph. This framed piece of sheet music of 'Tarantelle in A-flat for piano by Stephen Heller' measures 25x30cm and belonged to Sandy. It was given by her to Dave Swarbrick, who is now auctioning this item for charity. The item is authenticated by Dave Swarbrick in a signed declaration on the back of the frame.The proceeds of this auction will be donated to Ethiopiad, who have been working in Ethiopia since the late 80s and are a charity committed to using their funds to create self-sufficiency.